Paddy Fisher, right, makes a tackle in the Music City Bowl. The redshirt freshman linebacker is one of several NU standouts returning next season. NASHVILLE, Tenn. — The last time Northwestern won this many football games over a four-year period, it promptly stopped playing the sport. That won’t be the case this time. With their 32nd win since 2014 coming in Friday’s Music City Bowl, the No. 21 Wildcats (10-3, 7-2) tied the program record for victories over a four-season span that was set between 1902 and 1905 — and halted because the university then banned football until 1908. And although they will lose a star-studded senior class to graduation, an equally strong cast of underclassmen will seek to carry forward this year’s momentum into 2018. As coach Pat Fitzgerald frequently noted throughout this fall, NU played 25 true or redshirt freshmen this season, an unusually high number. Among them was linebacker Paddy Fisher, Big Ten Network’s defensive freshman of the year; linemen Rashawn Slater and Sam Miller, both regular starters on the offensive and defensive lines, respectively; and running back Jeremy Larkin, who showed encouraging flashes of skill while backing up senior Justin Jackson. Larkin in particular stood out against Kentucky (7-6, 4-4 SEC) in the bowl game, breaking a 64-yard run in the fourth quarter and finishing with a career-high 112 yards on nine carries. The redshirt freshman from Cincinnati had more than 80 total yards in three of his final five appearances this season and appears well-groomed to take over a heavy workload next fall. 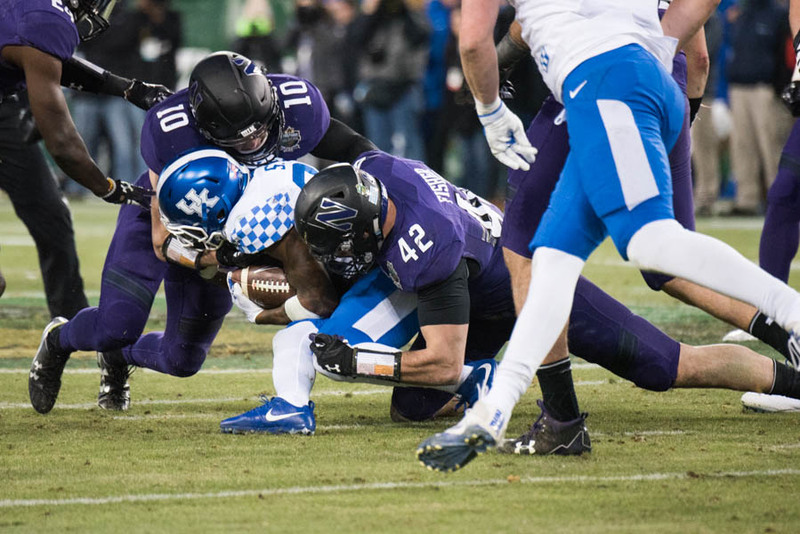 Sophomore defensive end Joe Gaziano capped his breakout campaign with another spectacular performance Friday and should replace graduating tackle Tyler Lancaster as the focal point of the Cats’ stellar defensive line moving forward. That unit’s dominance, combined with Fisher’s and junior Nate Hall’s efforts at linebacker, helped NU emerge as the ninth-best rush defense in the country in 2017. Offensively, Jackson and reliable superback Garrett Dickerson will be big losses, but junior quarterback Clayton Thorson — assuming he can recover fully from a likely serious leg injury suffered Friday — will be one of the most highly touted signal-callers in the nation next season after deciding not to declare for the NFL Draft. Thorson will be joined again by his top two targets from this season: sophomore Ben Skowronek, who showed major star potential with his 6-foot-4 frame and vertical athleticism this year, and junior Flynn Nagel, who led the team in receptions. All in all, the Cats are expected to bring back seven starters on each side of the ball, plus kicker Charlie Kuhbander. That’s an encouraging amount of continuity, but it remains to be seen whether the 2018 squad will be able to fulfill a long-spoken, not-yet-achieved Fitzgerald goal of winning the Big Ten West and reaching the conference championship game in Indianapolis. Wisconsin, which rolled through its regular season slate undefeated this year after topping NU 33-24 in the conference opener, is expected to return nine offensive starters but as few as three defensive starters.